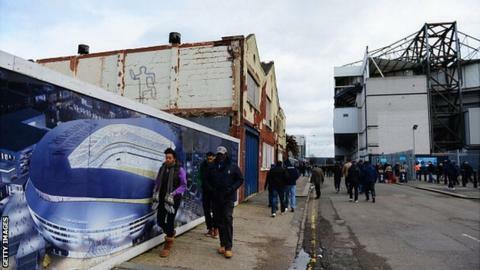 Tottenham have denied speculation the club is up for sale amid delays to the construction of their new stadium. Rumours that owner Joe Lewis was prepared to sell the club for up to £1bn were reported in the Daily Mirror. The club revealed on Wednesday they would have to spend a year playing away from White Hart Lane before moving into a new 56,250-capacity stadium. "Neither the club, nor its majority shareholder, are in any takeover discussions," a statement said. It added: "The focus of the club is fully on delivering the new stadium project." A High Court challenge, launched by a landowner on the site of the club's proposed new home, is set to delay its construction beyond the original proposed completion at the start of the 2017-18 Premier League season. Spurs have hired investment bank Rothschild to advise on the options to finance a move to a new stadium, next to their current White Hart Lane ground. The development is expected to cost between £400m and £450m. "The stadium redevelopment plans are a significant part of the future for both our club and the local area and represent a complex infrastructure project that requires funding," the Spurs statement added. "This substantial construction project requires discussions with multiple providers of finance so that the optimum financing package can be achieved. "To this end, we have appointed Rothschild to advise us on those options." Potential options for a temporary "home" ground for Spurs could include Wembley, the Olympic Stadium in Stratford and Stadium MK in Milton Keynes. Former club captain Gary Mabbutt played down reports Joe Lewis - who took control of Spurs in 2001 - was looking to sell. "All the top clubs are always being looked at to be purchased," he said. "We have a stable situation at the moment and hopefully that will continue." Mabbutt also warned Tottenham supporters a temporary move to Wembley may not be straightforward. "It's not quite as easy as just deciding where we'd like to play," said the former defender, who made more than 600 appearances for the club. A poll of 2,000 fans carried out by the Tottenham Hotspur Supporters' Trust found 85% would be happy with a year-long move to the national stadium, which is also in north London. The Olympic Stadium has been mooted, while it is thought talks have been held with Milton Keynes Dons over a move to Stadium MK. Mabbutt, now a club ambassador, told BBC Radio 5 live that the Wembley idea was not a simple one. "There is a lot of due diligence on the schedule of Wembley. They have concerts, they have other sporting events taking place," the 53-year-old said. "You're looking at other stadiums. Will it be big enough? Will it be acceptable for our fans? Is the pitch going to be the right size? Every team decides on the size due to the way they play. All these things will have to be taken into consideration." A ground share with rivals Arsenal at the Emirates Stadium is not thought to be among the options being considered. "Geographically it is a solution. It is a very sensitive subject but I don't think it will happen," Arsenal manager Arsene Wenger said. Tottenham Hotspur Supporters' Trust spokesman Martin Cloake said Wembley would be the preferred option. "From informal discussions, the assumption has always been that it would be Wembley," he said. "A move to Stratford would certainly raise eyebrows," Cloake added. "There would be some serious issues with MK Dons."